The troops of Generalmajor Klaus Vilsmaier snaked their way towards the city of Vergoldeten in long lines along the winding road, led by the 2nd Brigade under Brigadier Arnold Wenders. Rank after rank of the Fassbinder Musketeers led the way, well trained troops supplied by one of the better merchant families and clad in blue with black facings. Behind them marched the Gebühren Eber Grenadiers, resplendent in uniforms of golden yellow with their tall grenadier hats of the Austrian pattern. The Generalmajor was happy with their well formed lines and well kept appearance, but not quite so happy with the man commanding the brigade. Wenders was a fat textiles merchant whose products clothed the Grenadiers under his command, but Vilsmaier felt him better suited to counting coins than marshalling troops on a battlefield. Still, in an army funded by merchants, he was stuck with him. Behind the 2nd Brigade marched the men of the 4th Brigade, and here at least Vilsmaier could not question the choice of Brigadier. His own son, Jacob Vilsmaier, led a brigade composed of two mercenary battalions. Marching first and directly under the Brigadier's watchful eye were the blue-clad men of Freikorps Schütte, a unit which both Vilsmaier men viewed with some degree of distaste, as it was only recently formed and primarily from former prisoners of war, drunkards impressed while under the influence, and various vagabonds hoping for good pay and perhaps some baggage to spoil. Behind this unit, the smart green-faced red coats of Freikorps O'Toole made a much nicer picture. To a man, the troops over-strength battalion were Irish expatriates, and they had already proved their worth and their desire to fight on several occasions. It should be noted, as well, that it was not pure parental pride which drove Klaus Vilsmaier's estimation of the commander of the 4th Brigade. Like his father, Jacob Vislmaier had real combat experience from time spent in mercenary service, and was therefore well suited to command the brigade. It was a sizable force, on the scale of Ober-Schweinsberg battles. But then, it had to be, with both Princes believed to have sent forces towards the town. It was because of these forces that Klaus Vilsmaier had chosen to detour and approach from the northwest of the town to ensure that the Princes met first, and his own troops might have a clear path to the town while the forces of the two would-be Landgraves fought it out. There was just one thing which an inadequate intelligence network had failed to report to the Generalmajor, and that was the presence of a fourth force. Hesse-Engelburg, it seemed, had abandoned their previous contentment to simply control the borders and river traffic north and confine the troubles to Ober-Schweinsberg and had dispatched a force to enter into the struggle for the town, considering its location on the southern trade route important to their interests. And thus it came about that to the northeast of the town, Generalmajor Count Manfred von Waffenschmidt of Hesse-Engelburg pushed along a force of six battalions, divided into three temporary brigades of two battalions each. Leading the march were the men of the only unit to hold a battle honor, the Lintzer Musketeers, newly arrayed in facings of rich violet to replace their prior yellow. Behind them, in similar gray coats but green facings were the newly formed first battalion of the Sumpflöwen Musketeers, the Marsh Lions. Brigadier Werner Heintzen moved up and down the line, a man of promising steadiness but little real combat experience. Behind them marched the second brigade under Brigadier Rudolf Richter, composed of the Niederwiesen Musketeers and the Grauerhimmel Fusiliers, both well regarded regiments. 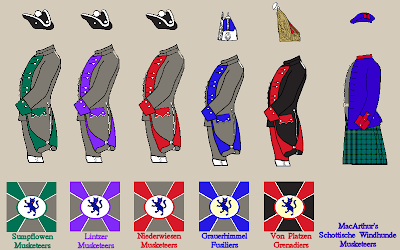 These units, too, marched in gray coats and trousers, the Niederwiesen faced with red and the Fusiliers with blue. It was a matter of one's personal tastes whether the eye was attracted first to the brighter facings of the Musketeers or to the sun's glint off the distinictive Fusilier caps. Bringing up the rear but by no means lower in status, the third brigade under Brigadier Franz Linkmeyer was slated to act as a reserve for the two leading brigades, prepared to lend its weight of fresh numbers and veteran fighters should it be needed. In this brigade the most distinctive uniforms were to be found. It was led by the famed Von Platzen Grenadiers in their black coats and red facings and trousers, their brass mitres shining in the sun's rays. At the rear but by no means less respected, the kilt-clad battalion of MacArthur's Schottische Windhunde Musketeers marched in proud ranks, led by the songs of their piper. As it happened, the forces of Bad Nachtschwein and Hesse-Engelburg would become aware of each other at almost the same moment. Brigadier Heintzen was to be glad of the veterans of the Lintzer Musketeers this day, as the head of his brigade made a smooth turn to reorient itself towards the newly discovered threat. It seemed as though the raw recruits of the Sumpflöwen Musketeers were eager not to be shown up by the veterans, for they too executed their change of facing quite smoothly, and advanced alongside the Lintzer battalion in good order. As the first Hesse-Engelburg brigade advanced in good order, the 2nd Bad Nachtschwein brigade managed to shake out of their own line of march and reorient, if somewhat less smoothly. Still, Brigadier Arnold Wenders' foghorn of a voice could be heard bellowing out attack orders above the drum rolls and other voices. Undetered by the bold Bad Nachtschwein advance, the first brigade of Hesse-Engelburg troops advanced into firing range and halted to deliver a withering volley into their advancing opponents, the Lintzer battalion facing off against the boldly colored uniforms of the Gebühren Eber Grenadiers while the Sumpflöwen Musketeers traded shot with the Fassbinder Musketeers. Though many Bad Nachtschweiners fell, both their battalions continued their advance, closing ranks as they stepped over the bodies of the fallen. For the Vilsmaiers, father and son, on what would become the left of the Bad Nachtschwein line, the view was not a promising one. As Heintzen's bold march drew ahead of the mercenary brigade as it worked to shake out into line, the second and third brigades of Hesse-Engelburg could be seen putting their training to work in smooth, crisp formation changes as they worked to catch up to their own advanced brigade, advancing in an unbroken line. A gap opened briefly before the Vilsmaiers between those two brigades, but closed well before any hope of exploiting it as the kilted MacArthurs and the Schwarze Grenadiers wheeled into position. The Freikorps Schütte began to justify their superiors' doubts at this point, proving sluggish despite the pushing of Jacob Vilsmaier to get them into position. This left the staunch Irish lines exposed to the fire of the entire right brigade of Hesse-Engelburg, blistering volleys littering the field with Irish bodies. Yet, the Irish were to show their mettle, standing firm beneath the withering fire. Meanwhile, on the Bad Nachtschwein right, the fire of the Lintzer and Sumpflöwen battalions finally became too much, and the bold advance was checked.....the Fassbinder regiment wavering and finally crumbling towards the rear. Though the Gebühren Eber Grenadiers maintained order, it was clear the Bad Nachtschwein forces were hopelessly outmatched, and the Vilsmaiers good enough officers to acknowledge this. A general retreat was sounded, a retreat which the Hesse-Engelburg forces were apparently quite content to allow unmolested as their columns began to reform and move towards the town proper. It's taken me a while to get the time to finish putting together this image, of the six Hesse-Engelburg battalions in operation at Vergoldeten. This also represents my first use of David's Highlander template, and a nifty little feature of Gimp allowed me to fill the kilt with the actual MacArthur tartan. Clicking on the image should bring up a larger copy.